Last major update issued on May 2, 2006 at 04:20 UTC. The geomagnetic field was inactive to very quiet on May 1. Solar wind speed ranged between 284 and 318 (all day average 295) km/sec. Solar flux measured at 20h UTC on 2.8 GHz was 93.4. The planetary A index was 2 (STAR Ap - based on the mean of three hour interval ap indices: 2.4). Three hour interval K indices: 00110101 (planetary), 11211100 (Boulder). At midnight there were 4 spotted regions on the visible solar disk. The solar flare activity level was low. A total of 1 C class event was recorded during the day. Region 10875 decayed further and has only negative polarity spots left. Flare: C1.0 long duration event peaking at 15:35 UTC. Region 10876 decayed further and could become spotless today. Region 10878 was generally unchanged and quiet. April 29: No partly or fully Earth directed CMEs were observed in LASCO imagery. April 30: A very faint CME may have been associated with a C1.8 flare in region 10875. LASCO C2 images has traces of this CME just before noon. May 1: A faint full halo CME was observed in LASCO C2 images from 16:30 UTC and was likely associated with a long duration C1 event in region 10875. 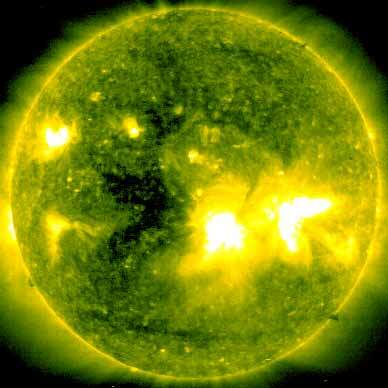 A recurrent trans equatorial coronal hole (CH222) will rotate into an Earth facing position on May 2-4. Processed SOHO/EIT 284 image at 01:06 UTC on May 2. The darkest areas on the solar disk are likely coronal holes. The geomagnetic field is expected to be quiet on May 2-3. 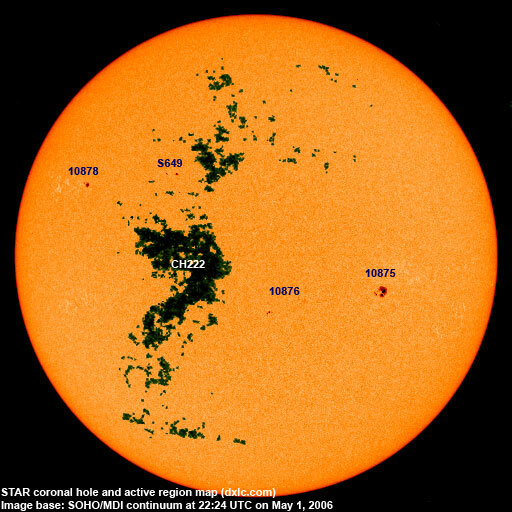 Slow CMEs observed on April 30 and May 1 could reach Earth on May 4 and cause unsettled to active conditions. A strong high speed stream from CH222 will likely reach Earth on May 5 and cause unsettled to minor or major storm conditions. Long distance low and medium frequency (below 2 MHz) propagation along east-west paths over high and upper middle latitudes is very poor to poor. Propagation on long distance northeast-southwest paths is poor. Trans Atlantic propagation conditions are normally monitored every night on 1470 kHz. Radio Vibración (Venezuela) and CPN Radio (Perú) had the best signals at local sunrise. Prior to LSR there were very few TA stations present. From North America only 1510 WWZN was heard with a weak signal.